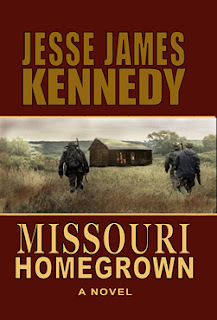 The two opening chapters of Missouri Homegrown are as brutal as anything I've read, and Jesse James Kennedy is just getting warmed up. So if you don't like a lot of violence in your reading, don't even think about this one. If you do like violence, this is the one for you. There aren't any heroes here. The people we're supposed to root for are the McCrays, a family of druggie dope-dealing killers, who are up against a Mexican cartel, made up of killers who are even worse. Okay, maybe not worse, but just as bad. And then there are the FBI agents who are after both groups. They're not quite as bad, but it's a close call. Lots of drugs of various kinds are consumed. Many people are killed and maimed or both. Not that there's anything wrong with that, since Kennedy has strong storytelling chops, and he's a good hand with character. Booklist compared this to the work of Don Winslow, and I suppose the reviewer was thinking of a book like The Power of the Dog. Probably not an unfair comparison, so that should give you an idea. Check it out. I have liked some Winslow, but not POWER OF THE DOG, and from your description, this in NOT for me. I don't mind some violence, but this sounds over the top. Sounds like my kind of boo. Loved Power of the Dog. Thanks for the notice on Kennedy's book. Definitely violent, and moves faster than anything I can think of that paid its due to character and setting. I live in Missouri, so wanted to read it just because it was about Missouri. It was very violent, but I really enjoyed it. Couldn't put it down.